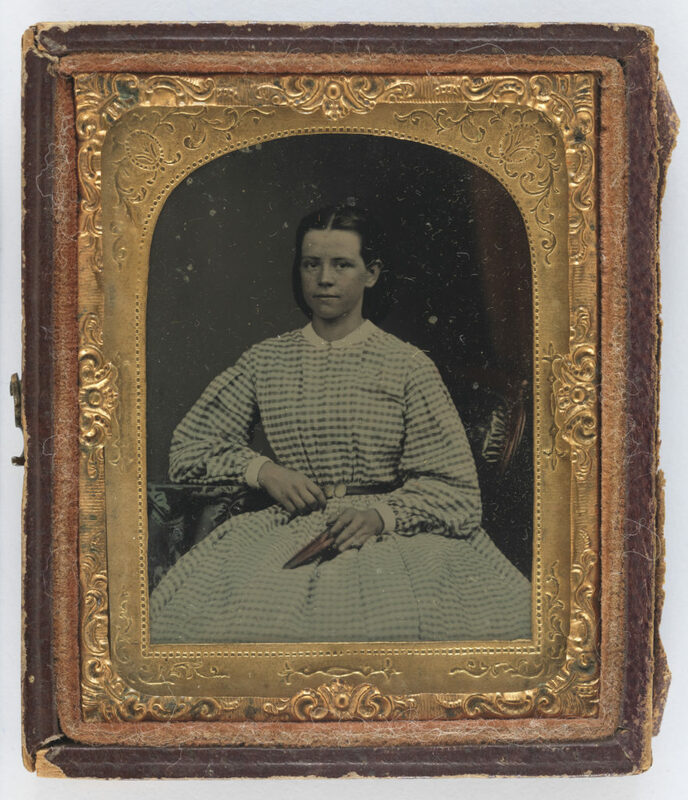 This ½ length front facing hand-coloured ambrotype portrait shows a young Rosa Troughton, aged in her late teens, before her marriage to George Beckett in 1863. She is posed in a drawing room setting, seated on a leather-upholstered side chair, holding a book in her lap with her left hand, her right arm resting on a prop table covered in a foliate-printed [plush] cloth with a dark red curtain draped behind. Roseina wears a simple ensemble which conforms exactly to casual summer fashions of the early 1860s, as does the use of a graphically-patterned textile like this [cotton] ‘gingham’ with its dark check on a light ground. Constructed either in one-piece or as separates, the new style of ‘skirt-and-waist’ seen here comprises a bloused ‘shirt-waist’ (also known as a ‘waist’) with a fuller front, gathered or pleated into a very high neckline worn with a narrow white collar, above a plain, full skirt pleated into the round waist band, marked by a contrasting belt fastening at centre front with a decorative buckle, and worn over the necessary underpinnings of hooped cage-crinoline with several layers petticoats to conceal the wires. The other defining feature of this dress is its large full ‘bishop’ sleeves, worn with narrow white cuffs. Seen in fashion plates from 1857, the bishop sleeve was cut in a curved ‘bent elbow’ shape, pleated into the armhole and gathered tightly into the wrist. Reaching its greatest width and popularity by about 1862, it persisted far into the decade. Though simply clothed, Roseina’s readiness to enter society is clearly signalled by the dressing of her dark, centre-parted hair in the customary adult style, brushed neatly and smoothly into a large roll, tucked behind her ears and pinned back at the nape of her neck.